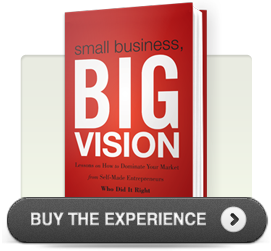 In Small Business, BIG Vision, we talk a lot about, well, vision – of course. One thing that will get in the way of reaching your vision more than just about anything else is making excuses for not taking the actions necessary to reach your goals. There are times when saying, “No” is much easier than saying, “Yes.” And there’s no doubt that sometimes “No” is the most appropriate answer. The trick is to know when you’re not doing something because it’s the right move, and when, in fact, you’re just making excuses. 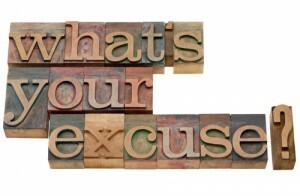 Not only do we sometimes make excuses to others, but often we can find we’re making excuses to ourselves. 1. I’m too busy: Using the excuse that you’re too busy won’t get you any sympathy from anyone, and it won’t get you what you really want. The fact is, we’re all busy. This isn’t something that’s exclusive to only you. Since everyone is busy, nobody’s really going to care how busy you are. The bottom line is that if something is important to us, we make time for it. Sometimes, people feel that using the “I’m busy” excuse will get them off the hook for not taking necessary action. The truth is, you’re just hurting yourself if you put things off – for any reason. Instead of using the excuse that you’re too busy, ask yourself what you need to be able to do everything that’s most important to you. Maybe it’s just better time management, or maybe it’s foregoing your weekly golf game. It’s a matter of prioritizing what’s important, and managing the 24 hours you have each day. 2. I’m too tired: Just as with “I’m busy,” telling yourself or someone else that you’re too tired to get things done won’t get you very far. Let’s face it; we are all tired a lot of the time. Using the excuse that you’re too tired to get things accomplished is just that – an excuse. People who are determined to get things done will get them done regardless of whether they’re tired or not. If you truly feel as though you’re too tired to do what’s needed to build your business, take a look at your diet, and the amount (and quality) of sleep you’re getting. Unless you have a medical condition, how you feel is in your hands. That’s what makes “I’m tired” an excuse. Take control of your own energy, and make sure you’re not to tired to make your dreams realities! 3. I don’t feel good: There will inevitably be times when you’re genuinely feeling too ill to get things done. Most people are sympathetic during times like these and will certainly cut you some slack, and it’s important to take care of yourself when you’re legitimately sick. The problem is that a lot of people use this excuse during times when they simply don’t feel like putting forth the effort required to get a project completed. Again, how you feel is almost always within your control. Make sure you’re taking care of yourself, and don’t let how you feel physically get in the way of accomplishing what you want in life. 4. I’m not sure if it’s a good idea: We often see entrepreneurs put off starting a business because they just don’t know if their idea will fly. Guess what – you won’t know. There is no surefire way to know without a doubt that any business is going to do well. There is one guarantee we can give you though: If you don’t even try, you definitely will not succeed. If you’re not sure your idea is a good one, you need to do your due diligence. Research the market, competitors, costs, and the needs of your target audience. You still won’t come away with a guarantee, but all you need is to be confident you have what it takes to make your idea a reality. With confidence, many “bad” ideas have been wildly successful! 5. It’s not the right time: Timing can be important. If you’re just now entering the vinyl record manufacturing business, you’re going to have a rough go of it. But that’s not the kind of timing that most people use as an excuse. What we often see is that entrepreneurs are waiting for the perfect time in their life, schedule, or career to launch their venture. Unfortunately, many great ideas never come to light, because that perfect time never comes. To move past this excuse, ask yourself how you can get started right now. Maybe starting now – when everything isn’t in perfect alignment – will mean it will take longer to get your business off the ground. That’s okay. If you wait for the perfect time, it may never happen! 6. I don’t know how to start: A lot of people have amazing ideas that are in no way related to their past experience or expertise. In many of these cases, they assume they won’t be able to be successful, because they don’t know how to get started. In reality, this is just an excuse. There is almost nothing that can’t be learned by someone of reasonable intelligence in a fairly short amount of time. The Internet has all the information you could ever want on almost any subject you can think of. It’s just a matter of wanting it bad enough to do what it takes to learn what you need to know. If you don’t know how to start, figure it out. Get help if you need to. Start networking with people who know more than you about the topic. The options are limitless – as long as you really want to get started. 7. I’m scared: How many great ideas never leave would-be entrepreneurs’ heads because they’re afraid of failure, criticism, or the unknown? Probably millions. What many people don’t realize is that the entrepreneurs who have become successful didn’t do so feeling no fear. They had the same fears and concerns but took action anyway. And that makes all the difference! 8. It’s not what I’m used to: We all have a comfort zone, and breaking out of it can feel like quite a daunting task. The reason you feel so comfortable in this zone is because you know exactly what to expect. In many ways, this goes back to #7. Allowing yourself to go out on a limb can feel terrifying because of a fear of failure. You fear that you may lose something, but the reality is that you have so much to gain. The trick is in becoming comfortable with the feeling of uncertainty and using it to your advantage. Rather than looking at a new venture as overwhelming and frightening, choose to look at it as a new and refreshing journey. You stand to gain so much more when you allow yourself to lower your walls of fear. 9. I’m too young or too old: When talking about business, age simply doesn’t have to be a factor. These days, younger and younger people are finding success in the business world. And nobody is ever too old to chase their dreams of business success. While you may feel that younger generations have an upper hand, this is not necessarily true. With age comes wisdom. Rather than using your age as an excuse, why not use it to your advantage? After all, there are considerable advantages to both young and seasoned entrepreneurs. And in the end, success has very little to do with age, and much more to do with passion and perseverance. 10. It’s impossible: When faced with an extremely difficult task, it’s natural to want to give up and consider the task to be impossible. However, the word “impossible” is not part of the vocabulary of true entrepreneurs. Yes, this may mean having to fail a few times before becoming successful, but even when we fail, we learn valuable lessons. So if something seems impossible, think of it instead as a challenge. If any person has ever done it, you can do it too. If not, you can be the first! Recognizing excuses for what they are is the first step in leaving them behind. Beyond that, it’s all up to you. You can either accept the excuses you’re giving yourself and others, or you can work to move past them. Which path do you think leads to your BIG Vision?